The Moving Finger Licks: Jeff Reviews KFC—The Colonel of Two Worlds - Wait, What? 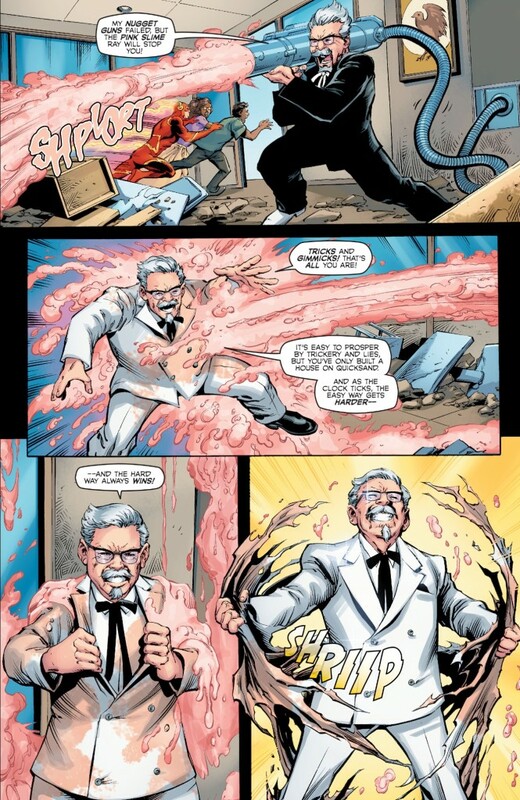 KFC: THE COLONEL OF TWO WORLDS: As a kid, back when comic books were more out of reach than they are now, I remember being delighted whenever a free comic came my way. For a few years there, teachers at my school passed out small comics from the main power utility where famous TV sitcom characters showed you (a) how to make a kite, and (b) how to avoid flying that kite into power lines. You have to admire the passive aggressiveness of the ad man who decided that an industry’s more pesky nuisances should also be its primary form of pre-adolescent outreach. I can’t remember if the freebie Smoky The Bear comics spent the first half showing you how to make a campfire in the woods, and the second half showing you the brutal repercussions of what happens when you make a campfire in the woods, but I wouldn’t be surprised. 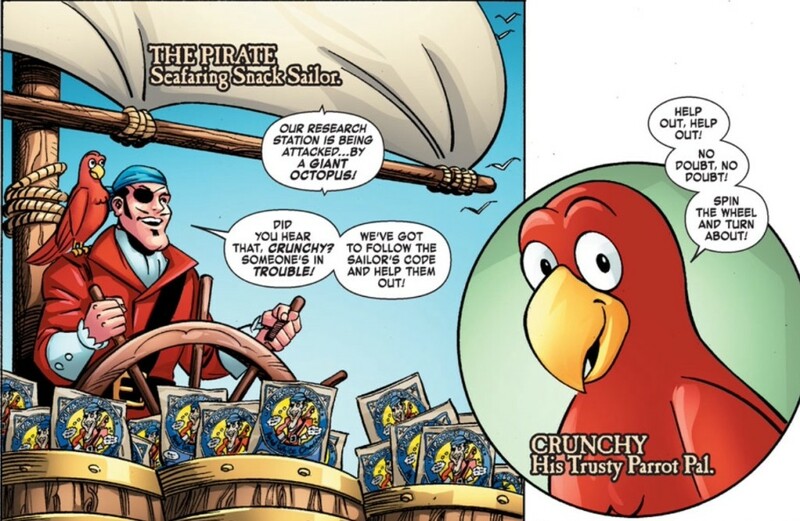 And the occasional promotional comic I’ve seen on Marvel Unlimited haven’t fared much better: the evocatively named Pirate’s Booty and The Avengers #1 has the Avengers arriving to help The Pirate and his talking parrot, Crunchy, save a marine research station from Attuma. And when I say “arrive,” I mean it: the Avengers literally do nothing in the comic but show up to be identified with free-floating captions, leaving all the action to The Pirate and his parrot. Even with the Avengers being drawn in an all-ages Marvel Universe style, they still don’t fit quite right with company mascots whose eyes are as round as any Disney character’s. Like the food itself, Pirate’s Booty and The Avengers #1 is mostly corn. 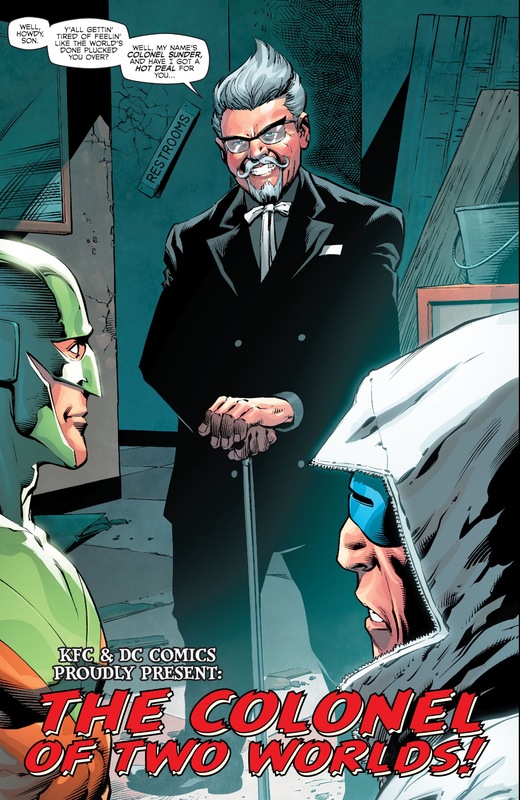 By contrast, in The Colonel of Two Worlds, The Flash and Green Lantern team up with Colonel Sanders to fight the Colonel of Earth 3, Colonel Sunder, who has in turn recruited Captain Cold and Mirror Master to help Sunder’s chicken chain, Easy Fried Chicken, infest our Earth. 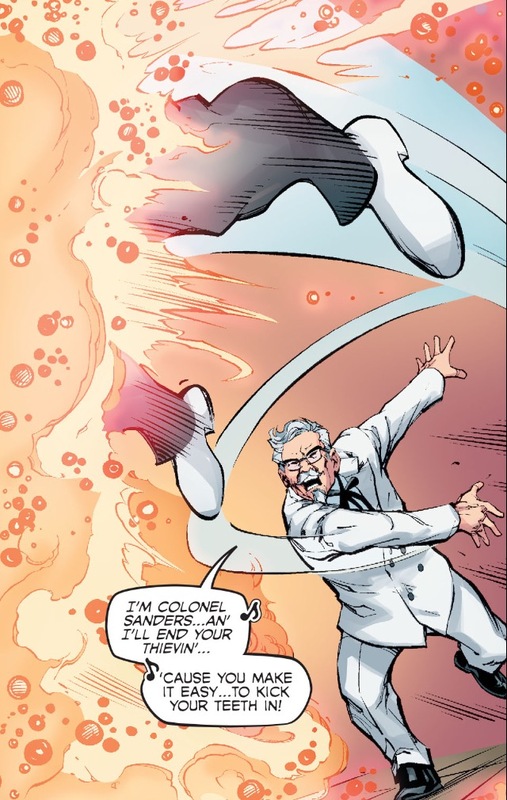 The Colonel is drawn in line with the DC house style, all fists and teeth, and while The Flash and Green Lantern, like the Avengers, do little more than show up, it’s an entirely different story where the two Colonels are concerned: punches are thrown, nugget guns are fired, pink slime rays are deployed, and at one point, Colonel Sanders rips off his slime-besmudged suit to reveal another pristine suit underneath. 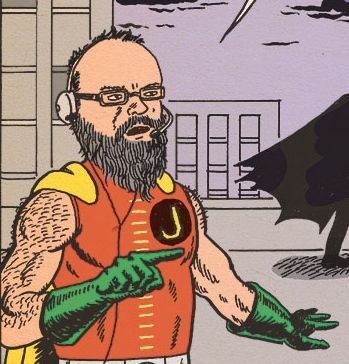 Writers Shane Edwards and Tony Bedard, and artists Tom Derenick and Trevor Scott (with an on-point cover by Tom Grummett and Scott) should all get more work from this. Although the lack of fun on such projects is usually due to an overly cautious client than the fault of the creative team, making a project straddle the “two worlds” and fulfill the prerequisites of each isn’t easy, especially in this case. Because while The Colonel of Two Worlds is unapologetically a piece of propaganda, it comes much closer to a Conan O’Brien sketch than one would expect. In that regard, it maps well with the current offbeat slate of KFC ads, which were born from the kind of desperation that comes from not only losing the top spot as America’s top chicken seller to Chick-Fil-A and facing difficulty with growth in China due to avian flu fears but, worst of all, from discovering that 60% of millennials hadn’t eaten at the chain [source: http://www.businessinsider.com/tons-of-kfc-customers-hate-the-new-tv-ad-2015-5 ]. The reception to the spots featuring first SNL alum Darrell Hammond and then SNL alum Norm Macdonald (interestingly, just like the promo comic, the commercials have an impostor narrative [link: https://youtu.be/er_owYCDZUk ]) have been mixed, with “one in five people” outright hating them. So when the CEO of a company actively embraces a loathing level of twenty percent—“because now they at least have an opinion. They’re actually talking about KFC, and you can market to love and hate; you cannot market to indifference.”—you know a company is desperate. (Also a pretty good sign? When the chief marketing officer says of the original Colonel Sanders, “he was the person with bling before bling was even a word.“) And desperation can lead to risks which, depending on your mindset, can be entertaining whether they succeed or fail. And so I admit some of what I enjoyed in The Colonel of Two Worlds is where those risks backfire. Colonel Sunder’s chain doesn’t resemble Chick-Fil-A or Chipotle or any of the real threats to KFC in any way: “Easy Fried Chicken” is a restaurant where the food is terrible but “easy,” the managers don’t care about anything but making enough money to open another franchise, and, strangely enough, the very presence of the restaurant is responsible for an increase in crime. Those frozen nugget guns and pink slime rays are pretty funny, but they’re odd coming from a chain that only a year ago had to apologize to Chinese customers for selling tainted meat, and even though the company is willing to pay lip service to the idea of healthy food–“We’re very on trend with that,” said that same chief marketing officer–KFC is still using chickens raised on crazily high level of antibiotics. In short, Colonel Sunder’s EFC is more like the KFC we know than the company would probably like to admit and yet, it’s hard to escape the comparisons when the comic keeps bringing them up. The commercials and the comic continually insist on how the Colonel Sanders being presented is “the real” Colonel Sanders but put him in situations that deliberately underline how fake the character actually is. Depending on how you look at it, this is either a particularly sophisticated double-blind—by openly pointing to their own fraudulence, the promotions are painting themselves as being more honest than other ads for other chains—or a blatantly cynical appeal to the audience, where the chain tries to win an audience over by casting doubt on any claim from any fast food company to bring you healthy food. “We know our lip service is lip service,” says this ad. “That’s why you should pay attention to what we really offer: a fuckton of food for a relatively inexpensive amount of money.” It’s as if the people programming the ad started on David Foster Wallace’s essay on television before flipping over to his essay on irony: all the ads need now are some tennis and a luxury cruise and they’d be Advertising’s Salute to A Supposedly Fun Thing I’ll Never Do Again. Anyway, it does make for a very fun little read. I don’t know if I’m any more likely to go into a KFC now than I was previously, but hey I’d eagerly read another KFC comic by this creative team. So that’s half a victory for KFC. Or it would be, I guess, if I was Millennial.